There has always been tritium in our environment. It is naturally formed in the uper levels of the atmosphere and falls down on the earth as rain. However, the development of human activities leading to tritium production, can represent a risk for human health. Tritium has a low radio-toxicity. The admissible derived concentration limit for a human being in contact with tritium is 8.105 Bq.m-3 for water and 1.1010 Bq.m-3 for gas. Thus, it is essential to continuously check that our nuclear equipments are properly functionning by monitoring tritium in all places where it is released in the environment (weapon industry, nuclear power plants, ...). 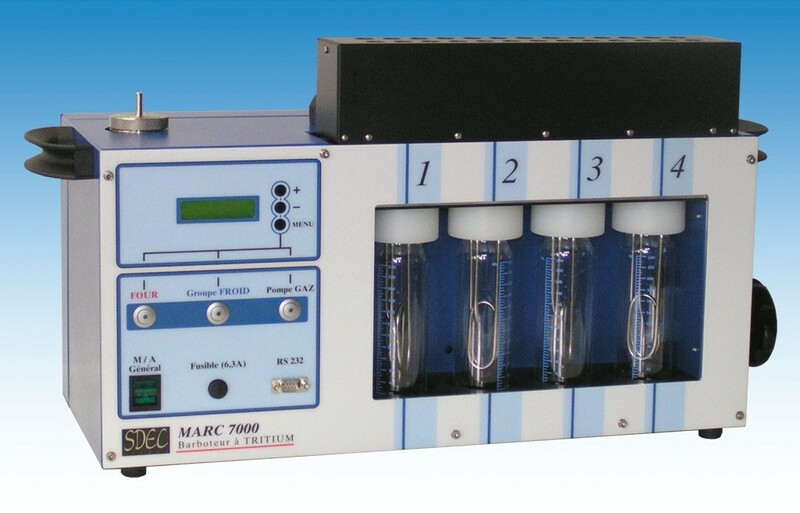 The MARC 7000 equipment is designed to sample the tritium which is contained in a volume of air (gas H3, tritiated water HTO or organically combined). Tritiated water vapor is trapped in the first two feeding bottles by means of the bubbling principle. To trap the tritium which is combined to organic materials, an oxidation reaction is created in the oven. A catalyser is used to lower the combustion level. This causes tritium to react chemically to form tritiated water vapor which is trapped in feeding bottles n°3 & 4. After a certain time, the tritiated water contained in the bottles is measured in a laboratory. The quantity of tritium measured is related to the volume of air which has passed through the equipment. Reduced evaporation due to the cooling system, allowing weekly collection. Membran air pump (long life time). - Particulates filtration at inlet. - Aeraulic circuit made of stainless steel. Easy to use, with instant opening cabinet for sample retrieval. - Display of flow rate and sampled air volume in real time. Alarms report. - Faults memorisation.